I've been invited to be a float participant and what they call a "Miracle-Groer" for Miracle-Gro's "California Grown" float in this coming New Year's Tournament of Roses Parade. I will be representing California home gardening, and in a symbolic gesture will be bringing plant material and flowers from my own garden to be used on the actual float. For more info, please read my post, A Special Invitation. Two days before Thanksgiving there was a community event "Kick Off to the Rose Parade" at the Pasadena John Muir High School's incredible school garden where there was a flurry of activities from installing a new pollinator garden, handing out turkeys to the community, a delicious garden-to-table lunch, a media opportunity, and a "Meet and Greet" with many of the "Movers and Shakers" including Miracle-Gro Executives, California Grown Officials, School Officials, Rose Bowl Officials, and Pasadena City Officials. My fellow Miracle-Groers are Ty Pennington, Mud Baron (Heads up Pasadena School Garden Program) from Los Angeles Region, Harry Van Wingerden of Myriad Flowers from Santa Barbara Region, Mel Resendiz of Resendiz Brothers Protea Growers from San Diego County, and Susan Phillips from Fresno Region. 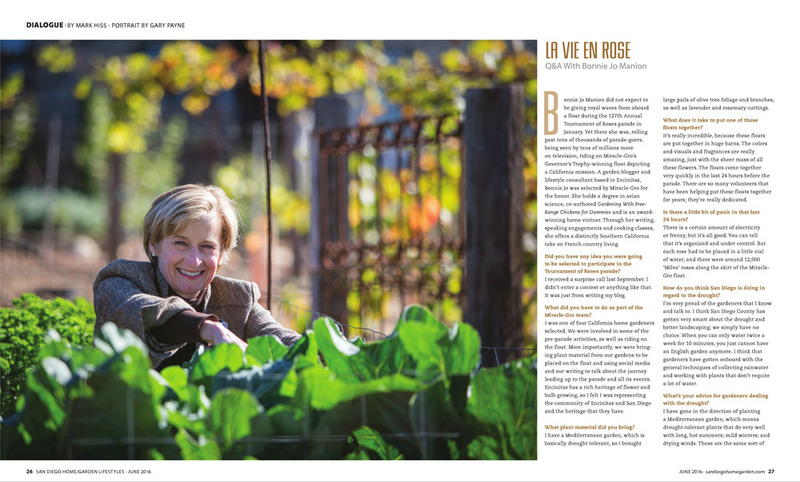 The Village Garden Club of La Jolla is pleased to present Style Icon and Lifestyle Maven, Carolyne Roehm for their "Meet the Masters 2016" program on Tuesday, February 9, 2016, 12 noon, at the Prado in Balboa Park, San Diego. The VGCLJ opens this event to non-member or guests, reservations are $125.00 per person, which includes valet parking, luncheon, and program. 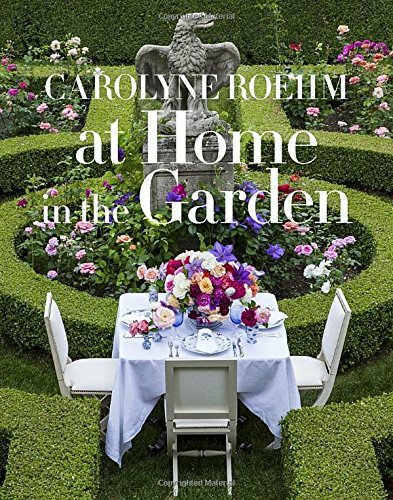 Carolyne's latest book, At Home in the Garden, will be for sale and available for signing. To make your reservation please send checks payable to VGLJ to: Bonnie Manion, 1279 Santa Fe Drive, Encinitas, CA 92024. For more information, feel free to contact Susie Dentt at (619) 447-2101 or myself, Bonnie Manion at (tel) (760) 402-7600. Feel free to pass this flyer and information to your friends. It is going to be a terrific event.